This morning’s revelation that Flame used a Microsoft certificate to sign update code underscores exactly what I said earlier about the real issue being that Flame had apparently been on the victim’s systems for at least a couple of years. Over the weekend, multiple reports appeared about a new piece of cyber malware, named, W32/Flame, Flamer or SkyWiper. I’ll stick with the official CARO name of W32/Flame.A. Smart Phones Do VPNs Too. Who Knew? What makes a tablet or smart phone a powerful tool? Every year the buzz grows around the Verizon RISK team’s release of its annual Data Breach Investigations Report (DBIR). As an incident response professional, the DBIR is one of my favorite reads. This year’s DBIR included analysis of security concerns in cloud computing. So for those of you interested in cloud security, this is the blog post for you! Continuing in the vein of Things That Normal People Need To Watch Out for, I came out of the gym a couple of weeks ago, and as I went to my car door to open it, I found the ground was covered by smashed windscreen glass. Having quickly assured myself that it didn’t come from my car, I found it came from the car beside me, and while I was contemplating this fact, the owner of said car came up, simultaneously talking on her cell phone, looking worried and trying to assure me that all was well. My view: Some cracks in Apple’s aura of invincibility? Let me preface this whole article by saying that these are my own personal thoughts and opinions, and in no way reflect those of my employer. 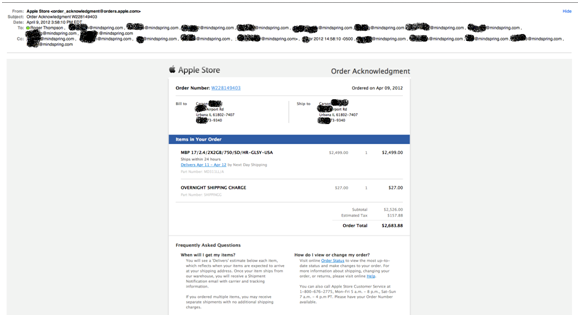 You can instantly tell it’s a phish by the fact that it is addressed to multiple recipients, but to my eyes, it is further proof of the changing situation for Macs. I nearly wasn’t going to write about this, as it seems so basic, but then I got my second direct pitch from them in less than two weeks, and if nothing else, I figure they deserve to be outed. It all starts with an email like this …. Over the weekend, my eyes were drawn to this sponsored ad on my Facebook page. Hmm… I’ve seen that sort of thing before, but it says it’s something to do with Amazon, so I click it, expecting to go to amazon.com.